Eric A. Smith is a lecturer, teacher, author, historian, and television talk show host. He received his Bachelor's Degree in Political Science from the University of California, Berkeley, and Masters of Arts Degree in History from Chicago State University. Eric is also a member of Phi Alpha Theta National Honor Society and has served as Past President of the Afro-American Genealogical & Historical Society of Chicago. 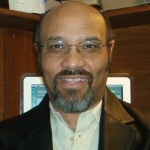 Eric has published articles in the Afro-American Genealogical & Historical Society of Chicago Newsletter and the Iowa Genealogical Journal, Hawkeye Heritage. His book Oak Hill: A Portrait of Black Life in Cedar Rapids, 1920-1950, (Los Angeles: Amen-Ra Theological Seminary Press, 2006), appeared in September, 2006. Eric's work has also appeared on websites such as Jefferson's Blood and been utilized by the PBS series, Frontline. Eric has given educational presentations on history and genealogy in numerous venues including in the Chicago Public Schools, The University of Chicago Laboratory Schools, the University of Illinois, Chicago; Chicago State University and the Afro-American Historical & Genealogical Society, Inc., National Conference in Salt Lake City, Utah in October 2006.